According to eMarketer, Instagram could have 26.9 million more US users by 2020, overtaking Facebook, Twitter and every other social media network on record. The social media platform also seems to be enjoying an unprecedented adoption and engagement rates among young adults, resulting in increasing mobile revenues. If you want to make the most of this social platform, you need to grow your following. Here are 10 ways to grow your Instagram following organically. Note: The easiest way to execute all of these ideas is by using a social media management tool such as DrumUp that simplifies publishing. Instagram’s geolocation feature has revolutionized local marketing. Using this feature, users can check what’s happening in any given location, giving local businesses an opportunity to catch their attention. Social media marketers can work with Instagram’s geolocation to maximize exposure for their brand’s content. 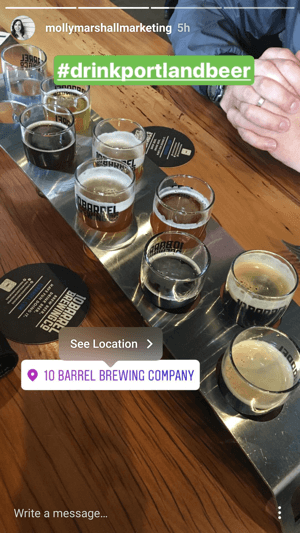 Instagram’s geolocation works in different content formats, but before you use any of them, ensure that your store or spot has a labelled location. If it doesn’t have one, you can “Create your location” on Facebook. Once you have, you can use geolocations in hashtags and stickers (on stories), apart from using them typically, as part of every Instagram post. When working with keywords and hashtags, it’s not always the best idea to go after the most popular hashtags. For instance, words such as #party and #summer may be more popular, but they won’t do much for your content or Instagram account in the long run. Instead, you can earn more exposure and engagement in your community by using more niche hashtags. 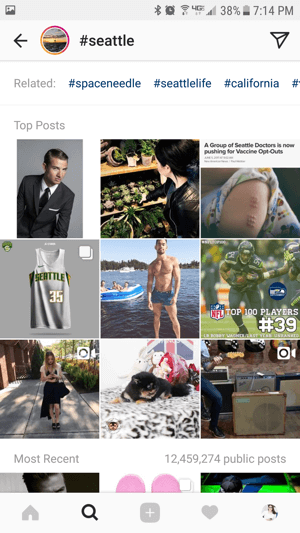 If you’ve noticed, Instagram has a “Trends” section that gets a lot of attention. You can make that section by trending for a specific hashtag. This is more likely when you target a more achievable, less sought-after hashtag. If you aren’t able to identify such opportunities, you could use a tool like Ink361 to do it. Instagram allows you 160 characters of space to introduce your account to potential followers and win them over. This space can make or break your first impression, so yes, what you say in it matters. Most businesses stick to plain and boring descriptions of what they do, but it’s those who go beyond the basics that stay in followers’ minds. What do you do? What drives you to do what you do? Why should followers invest any time on you? Answer these questions in a personal, compelling and memorable manner. You don’t have to commit to a particular bio, you can experiment with different ideas and stick with the one that earns you the most attention and compliments. 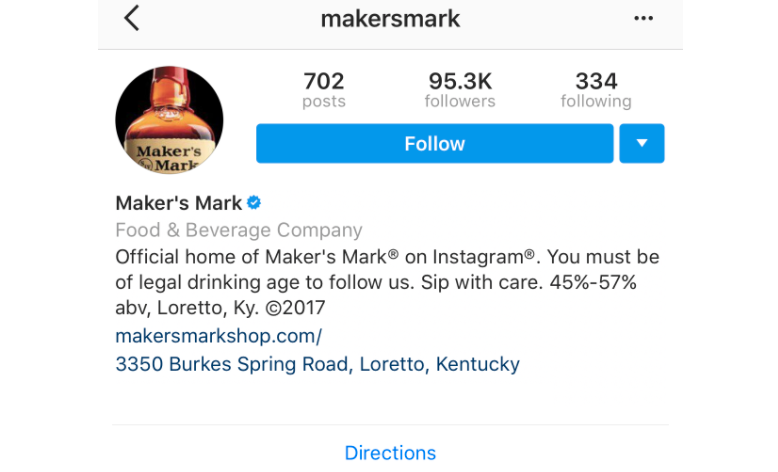 You could use some humor on your bio like Maker’s Mark has. It may be tempting to use your own name and make it popular, but don’t do that unless you already have a following on other social networks. Instead, think of keywords related to your niche that people are already searching for. Your account is likely to get a lot of free traffic if you can identify keywords that are also decently popular hashtags. Getting keywords as Instagram names can be tough, but it’s not impossible. Try and get creative and look for long-tailed keywords or phrases that are a combination of one or more shorter keywords. You can change your Instagram name, so keep testing different names until you find the perfect one. Instagram pods are small, closed groups of pro Instagrammers who help each other boost reach and engagement for Instagram posts. When you publish a post on Instagram, you have a defined window of time to get more exposure for the post before it becomes dated and disappears from all feeds. Pods can help you accomplish that objective. Many Instagrammers are networking and tieing up with other pros in the same niche, to help each other get access to a large number of Instagrammers. When a participant of the pod publishes a post, he or she DMs the rest of the group requesting them to like/comment and share the posts. The resulting organic engagement improves the individual’s chances of reaching more people and growing their Instagram following. There exist several Instagram accounts whose sole purpose is to curate content related to certain areas or topics. These accounts typically discover the content they curate by following a bunch of hashtags. You can catch the attention of these curator accounts by consistently using those hashtags on your Instagram posts. It can be super-hard to get features on the accounts of large curators, who already get thousands of submissions on a daily basis. The key is to find smaller, active communities that are both accessible and worth building relationships with. You can identify such communities by following hashtags yourself and observing the activity of other small Instagrammers in your niche. Giveaways have always worked wonders for brands who want to grow their email lists. You can use giveaways to get new followers, increase engagement and brand awareness or get exposure among local businesses and like-minded people. The first thing that you should do is decide which giveaway would be enticing enough to your target audience. However, running a giveaway contest involves a lot of factors that you should consider. Successful giveaway contests have the right hashtag, an attractive prize, means to monitor entries, factors to decide the winner and the right promotion plan. So each of your giveaways should ideally have the right strategy. Trends attract a lot of attention, which is why it makes sense for Instagram marketers to track and participate in them. When there’s an opportunity for you to align your content with trends, you should, because doing so can dramatically improve your engagement and reach. A good way to do this is by marking events on your calendar in advance, so you never miss participating in one. If you’re not sure which trends to hop on, start with holidays like #NationalCoffeeDay. It’s important to join these conversations in a meaningful way, else your target audience may make you out for trying too hard to get more eyeballs. If you have a Twitter, Facebook or LinkedIn page, or a blog with a following, you may assume that people following you there are already following you on every platform. Here’s news for you – they probably aren’t. By connecting your Facebook and other networks to Instagram, you can get your Instagram posts exposure among all of your followers across platforms. There are many ways to do this. The simplest would be to connect your Facebook and Instagram, and add social media plugins for all social networks on your website and blog. Once you have, you can cross-post content from one social network to another, depending on what’s possible and not. This strategy is particularly pertinent to Instagram marketing, because your followers don’t just see your latest post but see all of your posts in grid form. That’s why it’s critical for Instagram marketers to design a theme for each of the brands they manage. The theme can be anything, but it’s best if the theme is visually appealing. Some Instagrammers use multiple spaces in their grid to create larger images, like pieces of a puzzle. This feature gives you a lot of room for creativity and experimentation. You can use your grid to create something completely fresh, giving your Instagram account visitors something amazing to see. Instagram is probably the best visual social media platform for engagement, and to make the most of the opportunities it provides, you need to step-up your Instagram marketing game. This post provides 10 new ideas that you can use to grow your Instagram following and skyrocket your Instagram marketing results.